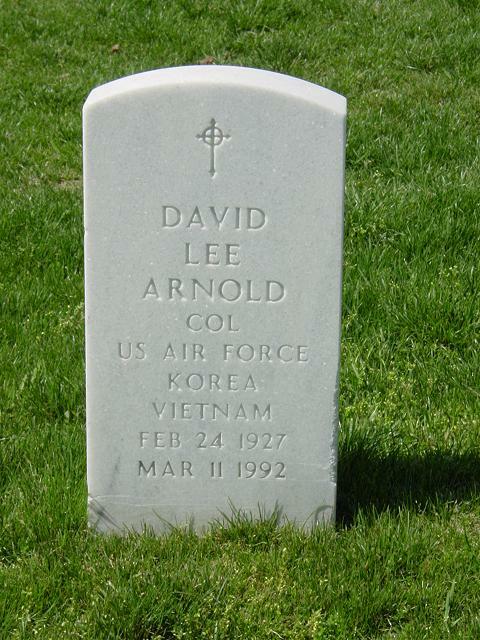 Colonel David Lee Arnold died on 11 March 1992 from complications of a stroke. He was the son of General Henry "Hap" Arnold and Eleanor Alexander Pool. He was born on 24 February 1927, at Fort Riley, Kansas. 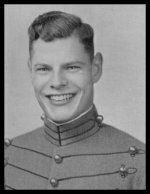 Following in the footsteps of his father and two brothers, he graduated from the United States Military Academy in June 1949. He received a Master of Arts in Government from George Washington University, Washington, D.C. in 1956. He also attended numerous nuclear weapons, computer programming and command service schools. During his career, Colonel Arnold served as technical intelligence analyst, staff planner, computer programmer and logistics officer. In the early 1960s, he designed and implemented a computerized information and retrieval system called ABACUS and later redesigned this system for an on-line remote environment. He was also one of the original officers assigned to the development of the Air Force's computerized wargaming capability. In his final assignment, he served as Comptroller at McClellan Air Force Base and continued the management of information systems. He retired in June 1979. Colonel Arnold received many awards and decorations, including the Legion of Merit, Bronze Star, the Air Force Commendation Medal and various campaign ribbons. Following retirement, Colonel Arnold remained active, not only with his consulting business and teaching at Sierra College, but also with his skiing and golf. In addition, in June 1983, Colonel Arnold joined the California State Military Reserve and was appointed Chief of Staff in August 1983. In September 1984, he was appointed commander of the First Infantry Brigade. His sense of humor was the core of his character. He never outgrew his love for playing pranks, and this more times than not got him into trouble, even at West Point. At one point, he decided that polishing shoes was inconvenient, if not downright annoying. So Colonel Arnold painted his feet black and marched in parade. Another time, while stationed in Germany, he dove into a pool and instantly realized that the water temperature was very cold. However, after swimming to the other side, he got out and, when asked by other would-be swimmers, "How was the water?" he replied, "Great, invigorating," without letting on that it would chill them to the bone. They, of course, dove in and immediately got out as fast as they could with eyes as big as saucers. He is survived by five children: Gay A. Morris of Alexandria, Virginia; David Lee Arnold, Jr. of Mansfield, Massachusetts; Lyn B. Arnold of Dover, Delaware; Edwin Roland Arnold of Auburn, California; Deanne A. Gray of Reno, Nevada; and six grandchildren. He is also survived by his brother William Bruce Arnold (Colonel, USAF, Retired) of Washington, D.C. Memorial services were held at Arlington Cemetery.